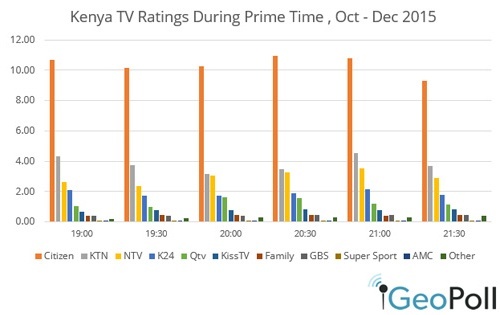 Using the daily data collected through Kantar-GeoPoll Media Measurement, GeoPoll has analyzed the top TV stations in Kenya and top TV stations in Tanzania for Q4 2015. 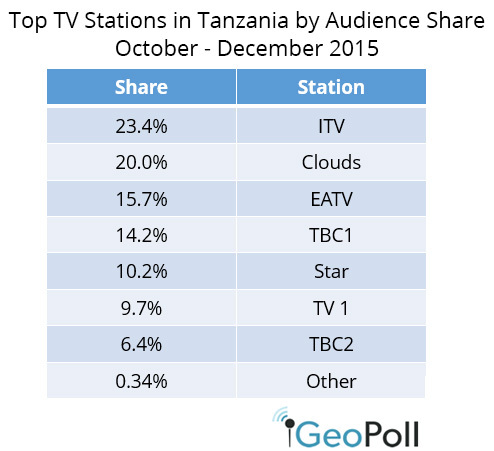 We examined both TV ratings* and share** for the top stations in Kenya and Tanzania. To view more detailed data, filter results by demographics, and plan ad spend based on KGMM’s audience measurement data in Africa please contact us. 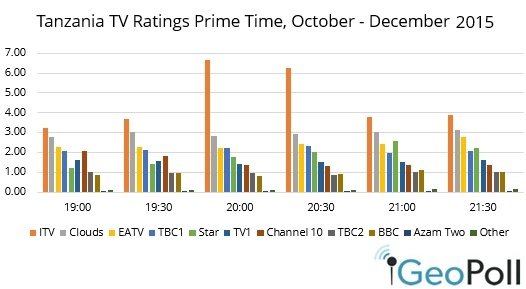 The below chart shows the average ratings from October 1st – December 31st 2015 for the top stations during prime time from 19:00 to 22:00. 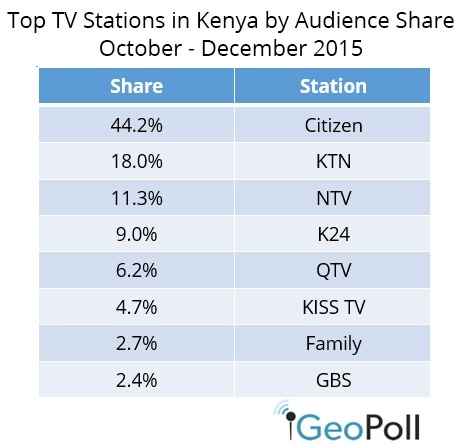 Citizen maintains the highest ratings throughout prime time followed by KTN then NTV. NTV ratings are highest at 19:00 and 21:00, when the Swahili and English news shows are aired respectively. KTN has its highest average rating at 21:00 each evening. The highest overall ratings recorded are at 19:00, 20:30 and 21:00 on Citizen Television. These times correspond with Citizen News’ airing of Swahili news at 19:00 and English news airing at 21:00 on Citizen. As demonstrated in the chart, on average ITV records the highest ratings on prime time followed by Clouds TV. This is consistent from 19:00 to 22:00. ITV sees its largest viewership spike at 20:00 to 21:00, with ratings above 6.0. Clouds TV has its highest average ratings at 19:30 and 21:00 – 22:00, when it records ratings around 3.0. EATV comes in third in the ratings consistently throughout prime time, except for at 21:00 when Star TV eclipses EATV’s ratings with an average rating of 2.8. To use KGMM data to analyze station performance, target audiences, and plan ad spend, contact us about subscribing to our daily data set. KGMM overnight ratings data is available 24/7 via an interactive dashboard that includes media planning and post-campaign evaluation tools.